Pay the price for ONE and get THREE reflective cat collars. Our cat collars are breakaway and 100% safe for your cat. Reflective collars size is adjustable 7-11". 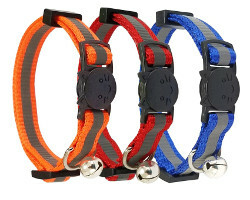 The review above is taken from Amazon and it is the most voted review on our collars. Our reflective cat collar is well made, high quality. We consider that we are offering the best deal on the internet. Go back to Cute Cat Collars homepage.